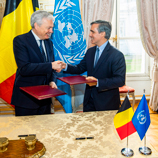 Brussels, 13 February 2019 – Belgium and the United Nations Office on Drugs and Crime (UNODC) have signed a new funding agreement worth two million euros to combat corruption and wildlife crime in Africa. The funds will boost UNODC’s efforts in this area and allow for increased support to African Member States. John Brandolino, UNODC Director of the Division for Treaty Affairs, highlighted that “the crimes of wildlife trafficking and corruption are bad enough but together they are devastating, adversely effecting societies and development on a number of fronts”. UNODC’s joint programme of technical assistance has been focusing on future proofing of wildlife management authorities in source countries against corruption, and on building capacity to conduct financial investigations linked to wildlife crimes.